ChARM EHR is Now on Your Smartphone! We here at ChARM EHR hope you're ready for a fun and productive week! In order to make your week easier AND more productive, we have a major new release we're excited to share with you. ChARM EHR is happy to introduce our new smartphone app! 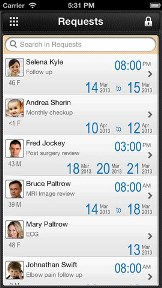 Now, you can easily access patient records and communicate with patients and staff from anywhere. Search and view patient contact details. It's also incredibly easy to get started. Just two steps! To learn more about the new ChARM EHR smartphone app, CLICK RIGHT HERE. We would love your feedback so please rate and review in the app store after you have had a chance to take the new app for a ride around your practice. P.S. Our next Webinar is scheduled for Friday, April 26th at 9:00am PDT. This will be an "Advanced Users" webinar in which our friend Dr. Igor Schwartzman will pick up where he left off in his last webinar and cover the essential tools he uses to make his practice more profitable. CLICK HERE TO REGISTER!